There are over 130 language groups in New York City. To reach so many nationalities, Gideons must be able minister in various languages. This year, thousands of New Testaments were distributed in a number of foreign languages, including Korean, Russian, Japanese, Thai, Portuguese, Italian, French, and Spanish. God was given the glory as the diversity of the team helped open doors for Gideons to speak to Chinese congregations and build relationships with pastors of multi-language churches. Gideons were invited to speak at a chapel service at Rikers Island State Penitentiary, the largest penitentiary in the U.S.A. The chaplain turned over the full hour of service time to Gideons who distributed New Testaments to all the inmates in attendance. Twenty of those inmates received Christ that day. One team member, a former police officer, organized distributions at over 76 police and fire precincts. Upon arrival at one police station, Gideons met an officer who immediately pulled out an Emergency Services Testament from his uniform pocket. He told them he had been carrying that Gideon-placed Scripture with him on duty for 10 years. The other officers and personnel at the precincts were also extremely receptive to the Gideons and God’s Word. To God’s glory, more than 6,300 Scriptures were distributed to emergency personnel. In a city known for its fast pace, it is easy to get caught up in agenda. The team took every opportunity to slow down and focus on individuals they encountered, following the Spirit’s lead. The result was many testimonies of salvation. For some team members, it was the first time they experienced the joy of leading someone to Christ. One afternoon, a small team of Gideons on Times Square led at least nine people to receive Christ. Jonathan Bauch has been a Gideon for three years. He has always wanted to participate in a Scripture Blitz. This year, a spot opened up the week before the NYC Blitz, and Bauch knew he had to go. “I just love to tell people God loves them.” One of the people Bauch got to share that message with in New York was John, a musician who was selling copies of his music on the street. “I asked him about his relationship with God and how sure he was he would go to heaven after he died.” Bauch then presented him with a New Testament and witnessed about Jesus. The musician responded. With people rushing by, the two men held hands and prayed right in the middle of Times Square as John accepted Christ. 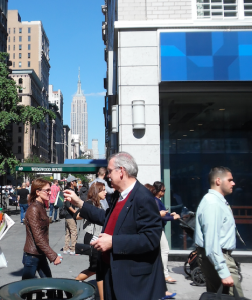 By the end of the week, over 236,000 Scriptures were distributed to the people of New York City. For the Gideons and Auxiliary participants, the city became more than a recognizable skyline or cultural icon. It became a symbol of many different nationalities—all right here in America—receptive to the Good News of Jesus. Please pray now for the New York City blitz leaders as they have already begun preparations for the city’s 2015 Scripture Blitz. We thank everyone who participated in this blitz, as well as those who supported it through their faithful prayers and giving. And most of all, we thank God for each and every Scripture distributed. While the 2014 NYC Scripture Blitz is over, the impact of the Scriptures shared that week is just beginning. God bless you I pray that He will establish the promise that blessed is the feet that take the good news to the world. To God be all glory! Great job Team! May God bless you bless the 2015 NYC Blitz planification! Praise God for the report from the New York City Scripture Blitz. Souls will continue to be added to salvation through Jesus Christ by His Word, for many years to come, because of the faithfulness of a few. It’s a privilege to engage in intercessary prayer to support the work of Gideon’s! And participate in distributions! We in Long Island appreciate greatly the work of Tor and Lars and The Gideon’s! May God so richly bless all Gideon’s! Jesus led by example and we should recall His words, “It’s more blessed to give than to receive.” On Calvary He Bought Paid For My Salvation! The Receipt reads, “PAID IN FULL.” Praise God! I am soo blessed by your report of the Scripture blitz in New York!!! God bless you, everyone who was involved! I pray that the Lord will continue to give wisdom and guidance to you Guideons and that the Holy Spirit’s work will increase the number of bringing unsaved souls across your paths so that EACH ONE will come to the decision to want to experience eternal life in Jesus – all in the name of our wonderful and great Savior, Jesus Christ.